Bus Redesign Prompts Question: Who is Public Transportation For? Carmen Terrell walks from the Pulse stop during her daily morning commute on Richmond's bus system. Last summer Richmond’s bus system got an overhaul. It was the first major redesign in decades. But now the agency that runs the public transit system is facing a civil rights complaint. Mallory Noe-Payne has this look at whether the changes benefit new riders at the expense of old riders - who are predominantly poor and black. Every morning Carmen Terrell hustles her kids out the door and to the bus stop. They travel across town so Barry, her ten-year-old son, can make it to his out of zone elementary school. Standing at the bus stop on a recent chilly morning, Barry describes the commute: three different busses with two transfers. Those transfers can be a challenge for his mother, who walks with a cane. A recent redesign of the entire region’s bus system streamlines many routes, and includes a new frequent reliable line called the Pulse. But for many, including Terrell, it means more transfers and longer walks. “Before the Pulse bus I only had to catch two. But now I got to catch three and get up a little bit earlier,” explains Shervon Horton, who commutes from the east end of the city to the west end for work. Others on the same bus, traveling from a predominantly black part of Richmond, say they face similar issues. Many say they don’t think officials considered them when planning the redesign. “At the end of the day the message is clear, if you don’t have enough green you ain’t seen,” says Terrell. Research out of Virginia Commonwealth University confirms that many low-income residents were negatively affected by the redesign. Sarin Adhikari, with VCU’s Center for Urban and Regional Analysis, evaluated the new bus system. He says the new bus routes expand overall access to the system, but when you hone in on low-income neighborhoods, there was a decrease in access measured by how far people have to walk to their nearest stop. “What we found was mostly those need based users who don’t have any alternatives. Those who are the ones who are mostly impacted, and those are the ones who are walking longer distances,” Adhikari says. "You can relocate that route a mile or two away if (a rider) is dependent on transit service to get to where they need to be they're going to make that walk." Last month, community activist Omari Al-Qadaffi filed a civil rights complaint with the Federal Transit Administration. He alleges the changes in service disproportionately hurt the city’s low-income black residents. Al-Qadaffi says he was outraged, especially when the local transit agency recently suggested adding lines in the west end after making cuts in the east end. He also points to the decision to reroute the Pulse Line around Church Hill, a predominantly black neighborhood, as well as stop the line at Rockett's Landing instead of continuing it into Fulton, another predominantly black neighborhood. “Public resources are being disinvested from a black neighborhood and being reappropriated to a whiter neighborhood,” says Al-Qadaffi. "If you are enacting policies that knowingly keep minorities oppressed, or that knowingly hurt minorities, then that is racism." The Greater Richmond Transit Company, or GRTC, says they’ve followed the law and acted according to what the community wants. According to their own analysis, the route changes don't unduly burden low-income or minority riders. For the purposes of that analysis, GRTC sets its own definition of what an undue burden is. GRTC spokeswoman Carrie Rose Pace explains that lines were cut because there weren’t enough riders to support frequent service. City Council has mandated that frequency be the priority when planning routes. Plus, the state sends more money to cities that can show they’ve increased ridership, and GRTC has seen a 12-percent jump in ridership over last year. This is at at time when transit agencies across the country are fighting to keep up ridership. Rose Pace adds that the changes benefit riders across the region. “Let’s say that you have to walk a few blocks to get to a different bus stop but now you can get a bus every 15 minutes from 5 in the morning to 1 in the morning, that’s an increase in service and that’s exactly what we did in this redesign,” she argues. 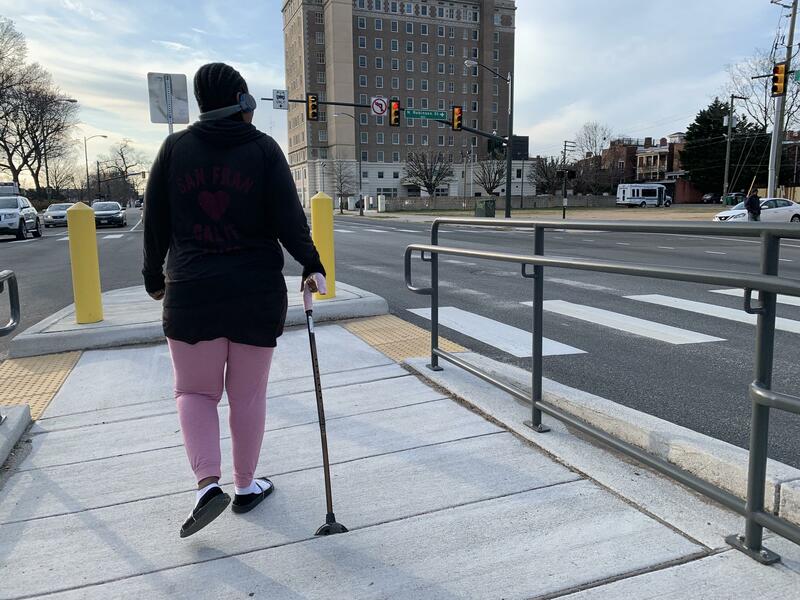 But advocates insist a few blocks can make a difference for people walking in unsafe neighborhoods, with young kids, or the elderly and disabled. Al-Qadaffi points out that when an agency is trying to attract new riders, it can take those who need the service for granted. “You can relocate that route a mile or two away if (a rider) is dependent on transit service to get to where they need to be they’re going to make that walk,” says Al-Qadaffi. Richmond isn’t alone in the debate over who public transportation should prioritize. And as cities gentrify and public transportation continues to compete for new riders, the conflict is only going to become more common. Tom Sanchez, an expert in Urban Planning at Virginia Tech, says the fundamental issue is that many cities, Richmond included, are segregated. That sets up planning decisions as us versus them. Something everyone can agree on is that increased funding would make these difficult choices, easier. Turnout across Virginia is reported to be heavier than an average mid-term election. In Richmond and other cities, to help get people to the polls bus rides are free.